The tentative title that I chose at the beginning of this project was ‘The Appearance of Architecture Groups of the 1980s’. As I was pondering the name and means of discerning the architects of this generation, I decided not to classify them under a commonly-shared theme but to focus on the common characteristics that were uniting members of his generation, and therefore I chose to go along with the original title. I admit. This project hopes to provide a description of the reality faced by the architect groups of the new generation as they embarked upon their work, and to also offer a glimpse of the possible worlds that these individuals will establish. Additionally, instead of rushing to give an account of their architecture and their achievements, I merely want to highlight the methods and attitudes that these individuals have adopted as their way of existing. The average age of these 43 architects from 17 teams became independent is 32.6 years old. They opened their offices mostly around 2013. While the early 30s is not young among today’s entrepreneurs, in the architectural world—where it is accepted, almost like a standard formula, to become an architect once one completes an undergraduate course at a local college and graduate studies overseas, such that it would be common to see ‘young’ architects in their 40s and ‘middle-aged’ architects in their 50s and 60s—their independent status at the mere age of 32 is bound to be noticed. Suddenly, architects in their early 30s have begun to appear, and they have formed their own living habitats by gathering among themselves. How did they become independent so quickly, and how has this happened at the same time? When they were asked in an earlier interview for their reasons for behind collaborative management, almost all of them gave the same answer: they did it because ‘one is weak alone’. Implying that when young architects gather as part of collaborative management, the burden of aspects such as finances and human resources is mitigated. Within their collaborative partnership, there is a certain implicit promise that ‘glory is accompanied by hardship’. While the formal reason for their early independence may be attributed to the fundamental reasons which can be noted in things such as the expansion of the small-scale architecture market, the new situation and demands of our changing era, and dissatisfaction with organisations. This is also due​ to the fact that the age-group of the consumers of architecture has become younger in general, the small-scale residential market that incorporates various lifestyles has expanded, and the general conception that young architecture groups are more relatable and flexible in their approach to problem resolutions has became prevalent. Different from the previous generations, who trained themselves at ateliers and strove for an elite position within society, these new and rising architect groups, composed of individuals born in the 1980s, try to create a market for themselves by riding along the waves of change in society and culture. As it can be surmised from names such as ‘Boundless’ and ‘B.U.S Architecture’ (By Undefined Scale), the architecture groups of the new era are not only involved in creating physical spaces, but they are performing various other roles such as real estate planning, branding, education, exhibitions, publications, and spatial management under a looser and unrestricted definition of architecture. It may be claimed that the range of their expansion in terms of business areas is not that different from that of the previous generation. However, the ratio of such projects is much higher, and their attitude towards such projects is decisively different. It seemed that they were not merely trying to expand their business scope to seek alternative solutions in face of decreasing opportunities for new construction; but rather, that they were trying to prove architecture within areas that seem unrelated to architecture by drawing in and connecting it to various projects and professional fields within the realm of architecture. As development declined, giving way to an era of low-growth, the number of new constructions dropped significantly, and the demand for remodeling and small-scale architecture rose in their place. Out of the 348 projects of these 17 teams, 192 were new constructions, 127 were remodeling projects, and the remaining 29 were other projects—in other words, 55% of the overall projects were new constructions and 67% of them were residential projects. Consequently, new construction projects of these 17 teams that were not residential projects comprised only about 18%. Compared to this, projects that included pre-design planning, such as management, real estate, and programmes, or post-design management, amounted to 17%. Moreover, architectural practice was demonstrated through exhibitions or educational programmes. Instead of mooning over the question of whether a certain project is architectural or not, the architecture groups of the new era have broken out from the frame of architecture to question how things beyond architecture can be architecturally approached, and are reclassifying the architect and his/her function. Would it be an exaggeration to say that ‘to eat and to sleep well’ is the dream of our current generation? Not merely giving up on dating, marriage, or having children, the ‘N-po generation’ (a generation that has given up on ‘n’ number of things) gives up on ‘far-fetched and uncertain ideals of happiness’ to grasp the ‘trivial but certain elements of happiness’. 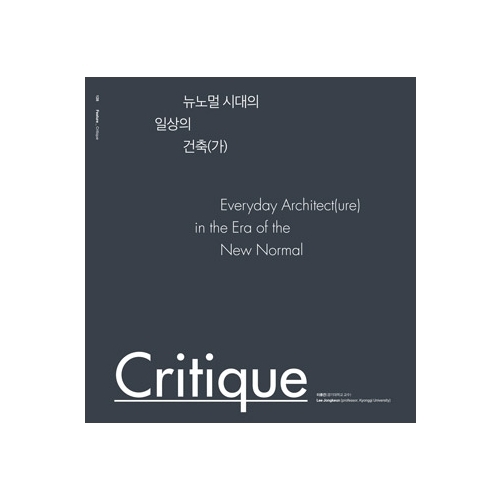 Without needing to refer back to the 1980s and the golden age of the architectural market, because the stage for performing architectural experiments via large-scale constructions such as the recent Paju Book City and Heyri Art Valley is no longer possible, there is also no room for ‘star architects’ to appear. There is no use in examining this generation from the nostalgic perspective of the past when ‘architecture changed the urban society and the world’, measuring them against past architectural achievements, and challenging them to realise their own architectural language. This is because they not only cannot but also do not wish to become star architects. Then is it fair to say that this ‘N-po generation’ has also given up on architecture? Like peers from their generation, they have merely turned to grasp the less-grandiose but more tangible architecture in place of the aesthetic achievement of an uncertain future. In this low-growth era, where requirements to live a normal life are becoming more demanding, they merely wish to set themselves down from the elevated status of an artist to the place of a worker as they live through this incoherence between what was passed down to them and what they personally experience, preferring to work with something more practical and light. Park Jihyun (co-principal, B.U.S Architecture) remarked that ‘there are many startup groups in other countries that go independent right after their college years. A culture that empathises and recognises their humorous and witty architecture is formed there, and we wish to become the pioneering generation to prove that it is possible for us architects in our 30s to do well’. While there were many opportunities for the previous generation to develop their unique architectural language, it also set the bar too high for a budding architect to begin one’s work. Only a certain class with capital could consider fabricating architectural structures, and there was a clear division between the realm of architecture and the realm of real estate business. Now, however, the architectural market has expanded in the form of the interior, remodeling, small-scale commercial space, and personal residential houses—and people are now approaching architects to build nice houses at a reasonable price. Things such as branding and total service, which used to be restricted to companies, also became freely accessible to the people. As architects began to engage with such small-scale everyday architecture, architecture began to seep naturally into the lives of the masses. The architects of the new era engage with the everyday spaces that are caught between urban planning, large-scale public space, and social institutions that were established by the previous generations, and aim towards a public essence while supporting the lives of various forms. For example, they improve the low-income residential environment by using air caps and polycarbonate, manage a shared kitchen using its regional character for it, and make it function as a platform for the regional community, prioritising a sense of residing of the tenant over the opinion of the renter, confront the building owner’s demands for an ornamental design that doesn’t fit the building exterior , and challenge the standardised design of a classroom by remodeling a classroom of an elementary school.